Ended On 03/24/2019 Thank you! To view canvases, click on VIEW ITEMS above, and select ALL ITEMS in the drop down menu. Happy Bidding! Canvases are exhibited at the KVR Visitor Center, S.3661 State Highway 131, La Farge Wi. until March 23, 2019. The Visitor Center is open Mon-Sat. 8am-4:30pm or by appointment. More information at kickapoovalley.wi.gov or find us on Facebook. 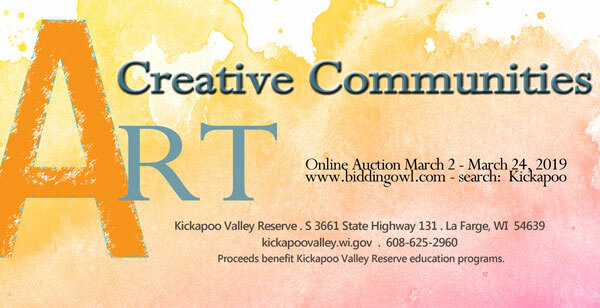 All proceeds benefit the KVR year-round, outdoor Education Program that brings over 5,000 students to the KVR annually. For more information on the Kickapoo Valley Reserve, La Farge, WI, visit our website: Kickapoo Valley Reserve or call the KVR Visitor Center at 608-625-2960.